The summer holiday season is in full swing, but some of us planning to go away have not even booked a break yet. While many are in the habit of making last-minute reservations for hotels and flights, but until recently holiday parks have been used to regular and early bookings. This year it appears that some of the best known British holiday brands are experiencing a sea-change in the industry, with a shift away from bookings six months in advance to last-minute enquiries. It is good news for customers who want flexibility, but means the leisure industry cannot accurately say whether it is having a profitable summer until the season is almost over. Seaside resort group Pontins is seeing general growth in bookings - with 10% more than last year. But it thinks this could be up 17% by the end of the holiday season, with so many of their customers choosing to book late. Late summer bookings are up a fifth compared to 2009, says Jason Brindle, sales and marketing director at Pontins. "Part of this increase could simply be the market, UK holidays are up in general, but it's been happening with us all year - late bookings for February half-term, Easter holidays, May bank holiday. We can find ourselves not knowing about demand until four weeks before." Although it makes forecasting profits difficult, it is not necessarily bad for business. "Twenty-five years ago Pontins would have been fully booked for summer by the end of March. Now we have to adapt," says Mr Brindle. "There are loyal customers, but most people react to deals and discounts and so people make their mind up later. You have to hold your nerve - spend the money on advertising and promotions and just have faith it will pay off by the end of summer." At Ribby Hall holiday park, near Blackpool, some guests enjoying a British summer break had taken advantage of late availability. Anne Hughes from Barrow-in-Furness booked on a Friday night, to arrive on the Monday. "It was an impulse to come, we weren't planning a summer escape really," she says. "We have two kids at university and we have to think carefully about what we spend our money on. But we knew if we came here we'd have a good time. There are plenty of deals on the internet." However, some guests, particularly those with young children, stuck to earlier booking patterns. Clare and Archie McIntyre from Liverpool were visiting Ribby Hall for the third time with their four children, aged between six years and eight months. "We booked quite far in advance as we have to come in the school holidays and it gets quite busy," Mrs McIntyre says. "There was a discount for advance bookings and I think this place would get booked up quite quickly." Ribby Hall can be booked though self-catering operator Hoseasons, which has reported ongoing growth in last-minute bookings over the last few years. In June 2009 around 2,000 guests booked within two weeks of the start of their break, but this June this had doubled to almost 4,000. Managing director Geoff Cowley looked to various distractions preventing people booking early - from the snow in January to the World Cup. "With the internet people can see how much availability there is in the market and that allows people to shop around," he says. "Some people are a lot less fussy about the exact date and the exact accommodation they require. It is a challenge for the industry to react to how customers want to make their bookings. "The economic climate must affect how people think about their holidays and certainly some people do not like to commit so far ahead as they used to." Media captionGeoff Cowley: "There's lots of people who will like to be flexible and book a lot later"
The same was true of other holiday companies. Haven reported an 8% increase in families booking within two weeks of arrival in June. In addition the well-known seaside resorts had seen a big change in the length of breaks booked. In the first two weeks of July there was a 25% increase in people taking weekend breaks instead of the usual seven nights - and 32% increase in the number of families taking 10- to 14-night holidays. Naomi Woodstock, sponsorship manager at Haven, says this is unusual for their market and could indicate that families who would have usually gone overseas are opting to stay in the UK. "The school summer holidays are up to a week shorter this year and therefore we have more people looking to go in a shorter time period; and a large tour operator has gone bust and airline crews continue to vote for strike action," she says. Haven also added that booking last minute does not necessarily mean cheapest. "Customers who booked their peak summer holiday before the end of October last year paid on average £30 less than someone booking a peak summer holiday now." And it's not just British resorts. Website Holidaylettings.co.uk, which books rental cottages across Europe, reported a 20% year-on-year increase for last-minute summer holidays, with one-third of accommodation enquiries in the first two weeks of July for July holidays. Their annual Travel Survey showed that 64% of customers said they prioritise holidays over other disposable income purchases, with affordability being assessed at short notice, rather than people saving up for holidays year round. Companies market hard for early booking. 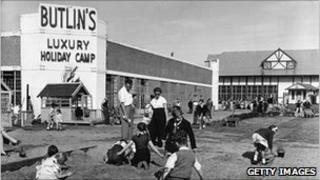 Butlins actually reported a 15% decline in late-bookings for within a fortnight, but a 25% increase in people booking within a month of their holiday starting. Centre Parcs said their late bookings figures remained flat. Both warn their customers they will be unlikely to get what they want if they leave it late. But it seems more and more Britons are willing to take that chance.